Some years ago, prior to my assignment in Guam, I had an odd experience. I had an appointment with a long-lost friend from abroad at the Mall of Asia. It was a Sunday, and the only time I had was after my last Mass for the day, which was about 8 PM. I was in some kind of a hurry. It was drizzling lightly, and traffic was light. Somewhere in Pasay City, while traversing EDSA to go to MOA, a man on a bicycle was on my lane, directly on my path. I needed to change lane. I looked at my rear view and side mirrors and knew the other two lanes at my left and right were free. So I did change lanes, confident that everything was legit. From out of the shadows, a group of “traffic” policemen suddenly flagged me down frantically. I was being cited for a traffic violation, and they called it “swerving.” I said that it was not at all swerving. They said I was “driving recklessly” by changing lanes. One of them, whose eyes were scanning the inside of the vehicle saw my chasuble still hanging near the rear window. He blurted out: “Oh, are you a priest?” I said, “Yes.” At that point, the whole group turned very friendly, and with wide smiles asked me what Parish Church I usually said my Sunday Masses. I told them. The leader of the band glibly and proudly told me: “Oh, that is where I go to Mass, too, Father.” “Sorry, Father!” And they let me go! Whatever happened to the so-called “traffic violation?” It was obvious to me (as I believe it is obvious to my readers) that it was all a “set-up” for them to make extra money on hapless and clueless motorists like me on a dark, rainy, Sunday evening. But that is not what really upset me. What really piqued me was the gall they had to claim that they dutifully and religiously go to Mass on the same parish Church I had celebrated Masses in. Like many Filipino Catholics who claim to believe, they “heard” the teachings more or less. But they may have misunderstood a whole lot of things. A few weeks ago, I was invited to a bio-ethics forum in a famous hospital in Manila. I was asked to react to the bio-ethical presentation and analysis of a group of young doctors featuring a classic case of a pregnant woman who also happened to have an ovarian cyst. After being duly informed about the pros and cons of an aggressive or a less aggressive chemotherapy, the woman, who “heard” the sound ethical principles, and who “understood” their full implications, decided autonomously, under the principle of so-called “informed consent,” to undergo the less aggressive treatment, for she wanted her baby to possibly live, and be brought to term. The discussion went well. The group understood that the decision of the patient was within the ambit of sound ethical reflection, applying the “principle of double effect.” The big group of doctors sort of got a consensus, even if not everyone who spoke saw it in the same way the presentors and the reactors did, including myself. I was momentarily petrified in my chair. Since we were just about to the close the session, I did not immediately know how to answer her. There was a pregnant silence from everyone in the room. I was flabbergasted, as I felt that what I thought was already a clear consensus, was muddled towards the end, and we felt we were back to square one, all of a sudden. I narrate these two vignettes because I feel they have a lot to do with the readings we heard today. 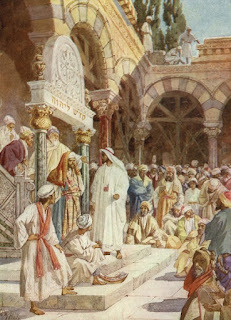 The first reading would have us understand what Moses told his people: “Hear the statutes and decrees which I am teaching you to observe, that you may live.” The two key words are “statutes and decrees,” which presumably, refer to God’s will in concrete, that are behind the moral norms that we Christians ought to hold onto and abide by. But the second reading seems to take it up a notch higher. James reminds his readers to “be doers of the word and not hearers only.” Simply put, James tells us to go beyond mere “hearing.” We need to go further and really “understand,” – and do accordingly! It is unfortunate that there are so many Catholics in our times, who claim to have “heard” the moral teachings, but who are less willing to “understand.” In our current context, the ordinary faithful who know very little of their faith are confused by so many groups who claim to be catholics, but who really do not belong to the fold. They claim to believe, and yet, using the very passport of faith, claim not to hold allegiance and loyalty to the very institution whose responsibility is to keep the deposit of that faith, and the teaching of moral behavior that is in accordance with that faith. Catholics for Choice, is one such group in the USA. Transported to the Philippines, where people ape everything that comes from the west, it became Catholics for RH. They claim to believe, but do not hold on to the entire teaching and tradition of the very same Church they claim to belong, but which they try to undermine from within! The whole nation is seriously divided on many fronts. We are divided politically and in many other aspects. Now, even catholics mistake “freedom of conscience” to mean “freedom from truth” and “freedom from objective guidance.” They reduce freedom of conscience to shallow and narrow personal preference, for they have divorced their conscience from timeless truths that the Magisterium teaches. In short, they have reduced themselves to being “cafeteria catholics,” who choose what to believe in, and who reject those that do not jibe with their personal conjectures, half-digested pious “truths,” and nothing more than just emotivism and matters of personal preferences. Freedom of conscience is their constant cry, but they never talk about educating their consciences to genuine, authentic, and “glorious liberty of the children of God,” based always on moral truths and objective criteria of right and wrong, based always, in turn, on natural law apprehended by reason, and enlightened by faith.